Huawei Mate X, launched at the Mobile World Congress in Barcelona recently, is expected to offer a new generation of connectivity, marking yet another shift in the development of smartphones. The Huawei Mate X, claimed to be the industry’s fastest 5G foldable smartphone, embeds innovative features that are geared towards user empowerment, offering a premium and unprecedented user-device interactivity. The Chinese tech giant said at the launch that the phone will start at 2299 euros (approximately $2600), and will be available in the middle of 2019. The device’s foldability is one of its most striking features as it enables it to turn into a tablet when needed. Its intricately designed hinge, referred to as Falcon Wing Foldable Design, is integrated in the display and folds out the screen – similarly to a falcon which extends its wings - turning the device into a perfectly flat, eight-inch tablet which offers users almost double the viewing area available in smartphone mode. 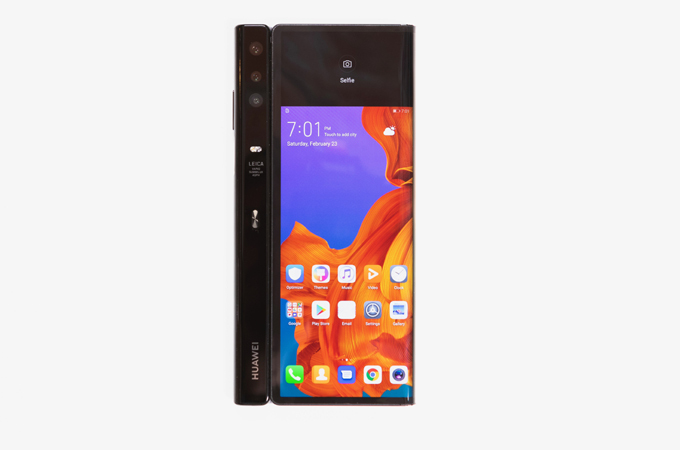 The device features new flexible OLED displays bringing users a premium viewing experience on a 6.6-inch dual display panel, which remains thin (5.4mm) while being highly durable according to Huawei’s tests – as well as safe thanks to its superior heat dissipation. In order to serve its immersive viewing purpose, the display features no holes or notches, becoming entirely bezel-less, offering users a distraction-free display for them to fully focus on work or entertainment. The flexibility behind switching from smartphone to tablet will give users the ability to maximise their productivity and make the most of their time – lessening logistics and eliminating the need to carry more than one device. Work becomes increasingly easy as reading or editing documents on the big screen is more practical, especially when combined with features such as dragging dropping. As for interactivity in entertainment, Mirror Shooting is an example that would be appealing to photography enthusiasts as it allows both the photographer and the subject to see what the photo would look like before it is taken thanks to a digital view finder appearing on both the primary and secondary displays – eliminating the need to take several shots until the subject is satisfied. Efficiency in interactivity is another important element in the Huawei Mate X, and it is displayed in the 2-in-1 fingerprint sensor and power button, which authenticates user identity rapidly and efficiently, keeping the device safe and secure. As for the 5G integration, the Huawei Mate X runs on the world’s first multi-mode 5G SoC with 7nm process and Huawei’s first commercial mobile device 5G capabilities, the Balong 5000 chip. It powerful despite being small, with the ability to support 2G, 3G, 4G and 5G with a single chip while effectively reducing the delay and power consumption and sub-6G full frequency band support, providing large network coverage. The Balong 5000 is also the first to achieve the industry's benchmark in 5G peak download rate, offering 4.6Gbps in Sub-6GHz – as well as the world’s first chipset to support SA and NSA simultaneously, with the ability to adapt to different hardware requirements and formats for users and telecom operators. Though slim, the HUAWEI Mate X’s body houses four sets of 5G antennas, which means users can enjoy quality 5G connectivity and high volume data transmission anywhere, enabling them to benefit from 5G’s high-quality connectivity and get more done. In order to empower users further and to achieve utmost practicality, the device embeds a massive 4500mAh which allows extensive usage before even beginning to run low. Combined with AI smart power-saving technology, it provides an even longer battery life for a maximized screen time.